Such a comfy and cosy top in soft viscose blend with plenty of stretch. The top has an inner bodice with a crossover front. The bodice can be lifted for discreet breastfeeding. The top also features a hoodie and a rouched elastic down the middle of the back for a very flattering fit. 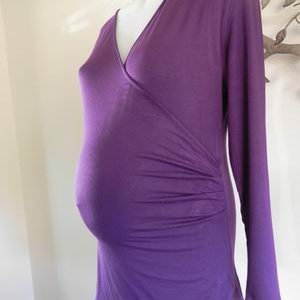 Perfect to wear through all stages of your pregnancy and beyond. The top is new without tags, a sample for Ninth Moon. Be the first to review “NEW Black Ballet Style Crossover Maternity Top with Hood” Click here to cancel reply.